Reading disorder is a learning disorder characterized by a significant disparity between an individual's general intelligence and his or her reading skills. Learning disorders , formerly called academic skills disorders, are disorders that account for difficulty learning and poor academic performance when low performance cannot be attributed to mental retardation , low intelligence, lack of learning opportunities, or such specific physical problems as vision or hearing deficits. Common learning disabilities include reading disorder (often called dyslexia), mathematics disorder , disorder of written expression , and some language processing disorders. Reading disorder was first recognized in the late nineteenth century, when it was called pure word blindness, then developmental alexia. Starting in the 1960s, educators commonly referred to reading disorder as dyslexia, from the Greek word dys , meaning poor or inadequate, and the word lexis meaning words or language. Despite the long history of reading disorder, its cause is not known. Learning to read is a complex task. It requires coordination of the eye muscles to follow a line of print, spatial orientation to interpret letters and words, visual memory to retain the meaning of letters and sight words, sequencing ability, a grasp of sentence structure and grammar, and the ability to categorize and analyze. In addition, the brain must integrate visual cues with memory and associate them with specific sounds. The sounds must then be associated with specific meanings. For comprehension, the meanings must be retained while a sentence or passage is read. Reading disorder occurs when any of these processes are disrupted. For that reason, the roots of reading disorder have proved difficult to isolate, and may be different in different individuals. Despite the complexity of reading disorder, researchers have found that the condition is at least partially inherited. In 1999, the Centre for Reading Research in Norway studied a large family with reading problems. By evaluating the reading and writing abilities of about 80 family members across four generations, the researchers were able to pinpoint mutations in specific genes that are associated with reading and writing deficits. It appears that reading disorder may also have causes other than genetic inheritance, as about half the people with this learning disability do not come from families with a history of the problem. Many theories suggest that functional problems in specific areas of the brain underlie reading disorder. Given the complicated demands on the human nervous system involved in reading, it is entirely possible that there are several different problems in brain function related to difficulty in learning to read. What is known is that 90% of children diagnosed with reading disorder have other language deficits. Still other research suggests a possible link with a subtle visual problem that affects the speed with which affected people can read. Reading disorder is most commonly called dyslexia. Dyslexia, however, usually includes deficits in spelling and writing as well as reading. Symptoms of reading disorder include poor comprehension, reversal of words or letters while reading, and difficulty decoding syllables or single words and associating them with specific sounds (phonics). 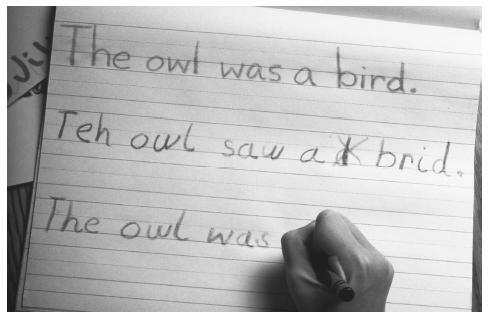 Here, a child with dyslexia attempts to reproduce a teacher's sentence. Evaluation of children's reading ability must be done on an individual basis in order to make a diagnosis of reading disorder and distinguish it from slow learning or low intelligence. The examiner must take into account the child's age, intelligence, educational opportunities, and such cultural factors as whether the language spoken at home is different from the language taught and used at school. Reading disorder is diagnosed when a child's reading achievement is substantially below what would be expected after taking these factors into account. In addition, the reading problems must interfere in significant ways with the person's schoolwork or daily life. If a physical condition is present (for example, mental retardation, poor eyesight, or hearing loss), the reading deficit must be in excess of what one would normally associate with the physical handicap. Diagnosis is complicated by the fact that 20%–55% of children with reading disorder have attention-deficit/hyperactivity disorder (ADHD), a behavioral disorder that aggravates learning difficulties. In addition, about one-quarter of children with reading disorder have conduct disorder . Oppositional defiant disorder and depression also occur in higher-than-average rates in children with reading disorder. Almost all people with reading disorder have difficulties spelling, and about 80% of them have other language problems. Anyone who is suspected of having reading disorder or any other learning disability should have a comprehensive evaluation, including hearing, vision, and intelligence testing. The test should include all areas of learning and learning processes, not just reading. In school-age children, this evaluation often involves a team of educators, educational psychologists, and child psychiatrists. Estimates by the National Institutes of Health of the number of people with learning disorders range from 5%–15% of the general population. About 80% of people with a learning disorder have reading disorder. Other studies suggest that about 4% of school-age children have reading disorder. People with reading disorder are more likely to have a parent or sibling with the disorder. Between 60% and 80% of children diagnosed with reading disorder are boys. For various reasons often related to behavior, boys tend to be referred more frequently to special education classes, which suggests that girls with reading disorder may be underdiagnosed. Some experts think that this disparity comes about because boys are more often disruptive in class. Reading disorder, like other learning disorders, falls under the federal Individuals with Disabilities Education Act (IDEA). Definitions of learning disabilities vary among the states, and some school districts are more willing than others to recognize specific learning disabilities. Any child, however, who has a diagnosed learning disability, including reading disorder or dyslexia, should be eligible for an Individual Education Program (IEP) that provides customized instruction at school designed to address the disability. Treatment approaches vary from visual stimulation to special diets to enhanced reading instruction. However, it is generally agreed that customized education is the only successful remedy. The American Academy of Ophthalmology, the American Academy of Pediatrics, and the American Association for Pediatric Ophthalmology and Strabismus have issued a policy statement warning against visual treatments and recommending a cross-disciplinary educational approach. Sound/symbol (phonics)-based. They break words down into their smallest visual components: letters and the sounds associated with them. Multisensory. Good programs attempt to form and strengthen mental associations among visual, auditory, and kinesthetic channels of stimulation. The student simultaneously sees, feels, and says the sound-symbol association. For example, a student may trace the letter or letter combination with his or her finger while pronouncing a word out loud. Highly structured. Remediation begins at the level of the single letter-sound; works up to digraphs (a pair of letters representing a single speech sound); then syllables; then into words and sentences in a systematic fashion. Repetitive drill and practice serve to form necessary associations between sounds and written symbols. Many famous and successful people have suffered from reading disorders, including at least two Presidents of the United States. How well a person compensates for this disorder depends on the severity of the impairment and the type of educational remediation that he or she receives. Generally, people who are identified as having a reading disorder before grade three and who receive intensive reading education can do well. There is, however, a great deal of variation among people in intelligence, educational opportunities, and the will to overcome a reading disorder, as well as in the type and severity of the problem. All these factors combine to determine the ultimate outcome of this disorder. The prognosis is usually good if the condition is diagnosed early and the person is enrolled in a good remedial program. Strong self-esteem, together with supportive family, friends, and teachers also improve a person's chances of overcoming this disorder. There is no known way to prevent reading disorder. Early intervention is the key to preventing the associated symptoms of low self-esteem, lack of interest in school, and poor behavior that often accompany low academic achievement. Hales, Robert E., Stuart C. Yudofsky, and John A. Talbot. The American Psychiatric Press Textbook of Psychiatry. 3rd ed. Washington, DC: American Psychiatric Press, 2000. Sadock, Benjamin J. and Virginia A. Sadock, eds. Comprehensive Textbook of Psychiatry. 7th ed. Vol. 2. Philadelphia: Lippincott Williams and Wilkins, 2000. Bower, Bruce. "Dyslexia Tied to Disrupted Brain Network." Science News 153 (7 March 1998): 150. Matvy, Mike. "A Silicon Bullet for Dyslexia: A new Solution for an Old Problem." The Exceptional Parent 30 (November 2000) 52-56. Learning Disabilities Association. 4156 Library Rd., Pittsburgh, PA 15234. (412) 341-1515. <http://www.ladnatl.org> . National Center for Learning Disabilities. 381 Park Avenue South, Suite 1401, New York, NY 10016. (212) 545-7510. <http://www.ncld.org> . Dyslexia Resources on the Web. <http://home.clara.net/ghrow/subjects/dyslexia.html> . Extensive links to dyslexia resources; updated frequently. My granddaughter who is 8 struggles with reading and has been tested. She's in need of professional assistance which we have found to be expensive. Is there funding/grants, etc. to help with parents/grandparents to pay the costs?